Mari is a self-employed visual artist working in acrylics and mixed-media, producing abstracted paintings mainly inspired by landscape: rural, coastal and industrial. She is also a printmaker of limited edition collagraphs. 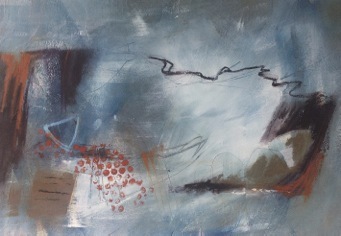 The evocation of weather and light on the landscape informs much of her art. Mari prefers to paint from abstraction, allowing the materials free reign before fine tuning emerging features. 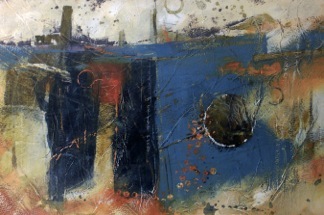 She paints textured pieces in acrylics and mixed media, often embedding material into the work. She also works in wet-in-wet watercolour. Her interest is in conjuring up the experience of a place rather than its faithful representation. Mari will be spending time at Stiwdio Maelor in order to study and paint in an upland landscape as a complete contrast to the low agricultural fields and saltmarsh coast of Norfolk where she presently lives and works. 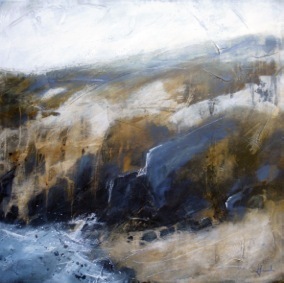 She is also very interested in exploring the slate mining area around Collis, as a possible extension of the work she began on her last residency at Cape Cornwall; there she was inspired by the wealth of colour, form and abstract nature of the tin and copper mining ruins of West Penwith.